« SLOB 2.3 Data Loading Failed? Here’s a Quick Diagnosis Tip. SLOB Use Cases By Industry Vendors. Learn SLOB, Speak The Experts’ Language. For general SLOB information, please visit: https://kevinclosson.net/slob. Beyond vendors, I’ll show SLOB usage at Kernel.org as well. This is just a quick blog entry to showcase a few of the publications from IT vendors showcasing SLOB. SLOB allows performance engineers to speak in short sentences. As I’ve pointed out before, SLOB is not used to test how well Oracle handles transactions. If you are worried that Oracle cannot handle transactions then you have bigger problems than what can be tested with SLOB. 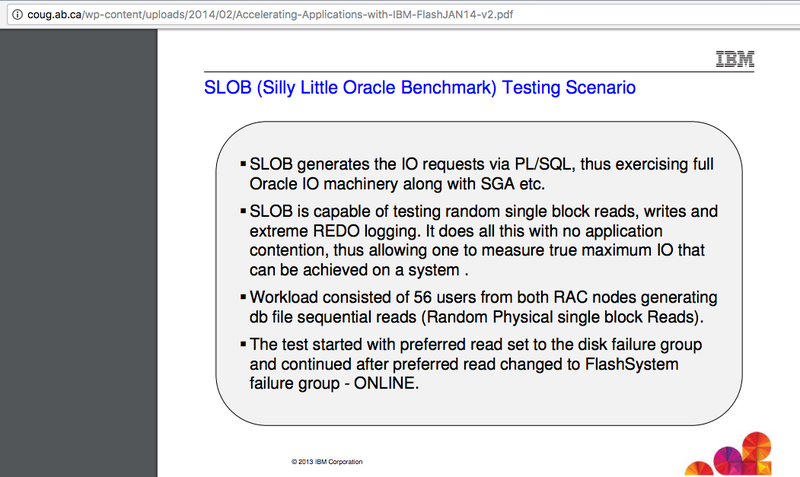 SLOB is how you test whether–or how well–a platform can satisfy SQL-driven database physical I/O. SLOB testing is not at all like using a transactional test kit (e.g., TPC-C). Transactional test kits are, first and foremost, Oracle intrinsic code testing kits (the code of the server itself). 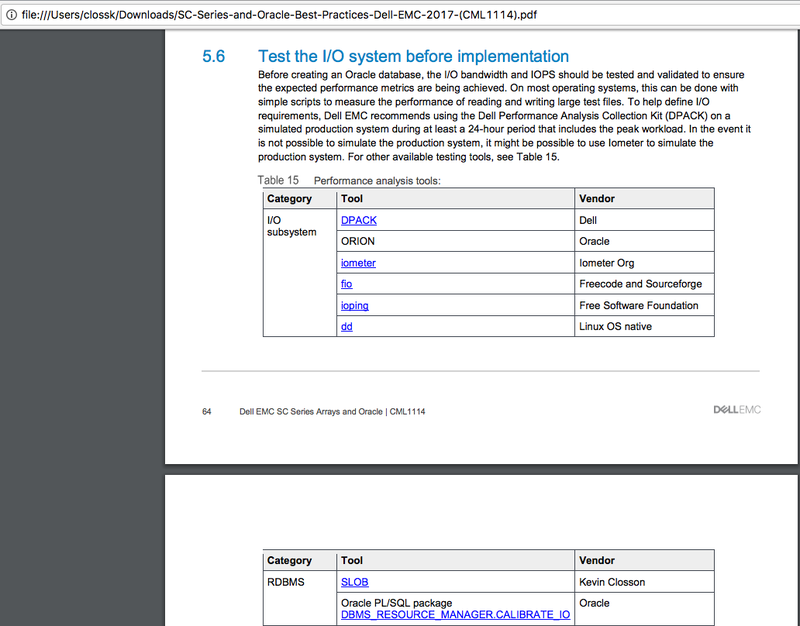 Here again I say if you are questioning (testing) Oracle transaction layer code then something is really wrong. Sure, transactional kits involve physical I/O but the ratio of CPU utilization to physical I/O is generally not conducive to testing even mid-range modern storage without massive compute capability. This is why vendors and dutiful systems experts rely on SLOB. Recent SLOB testing on top-bin Broadwell Xeons (E5-2699v4) show that each core is able to drive over 50,000 physical read IOPS (db file sequential read). On the contrary 50,000 IOPS is about what one would expect from over a dozen of such cores with a transactional test kit because the CPU is being used to execute Oracle intrinsic transaction code paths and, indeed, some sundry I/O. The following are links and screenshots from various vendors showing some of their SLOB use cases. 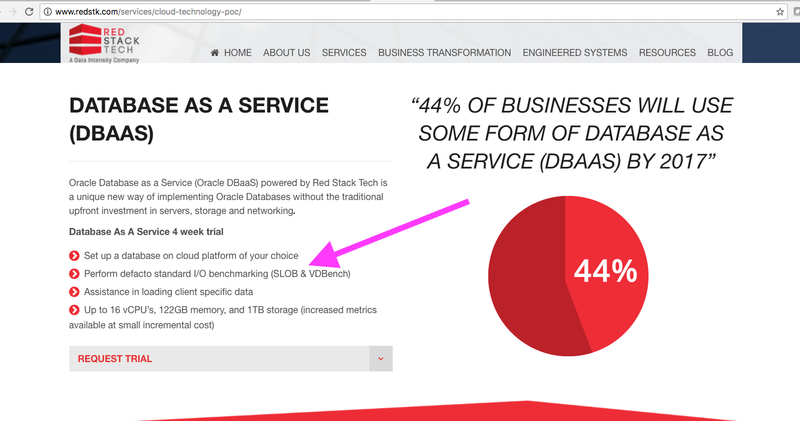 Generally speaking, if you are shopping for modern storage–optimized for Oracle Database–you should expect to see SLOB results in a vendor’s literature. I do recommend getting a copy of this paper! 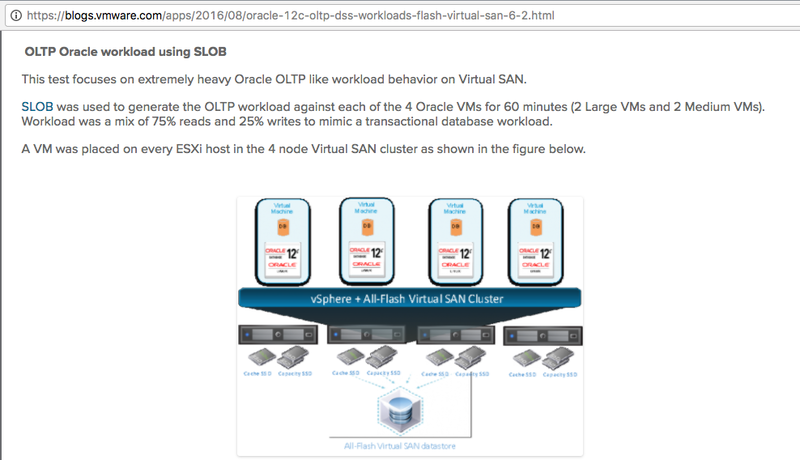 VMware showcasing VSAN with Oracle using SLOB at: https://blogs.vmware.com/apps/2016/08/oracle-12c-oltp-dss-workloads-flash-virtual-san-6-2.html. 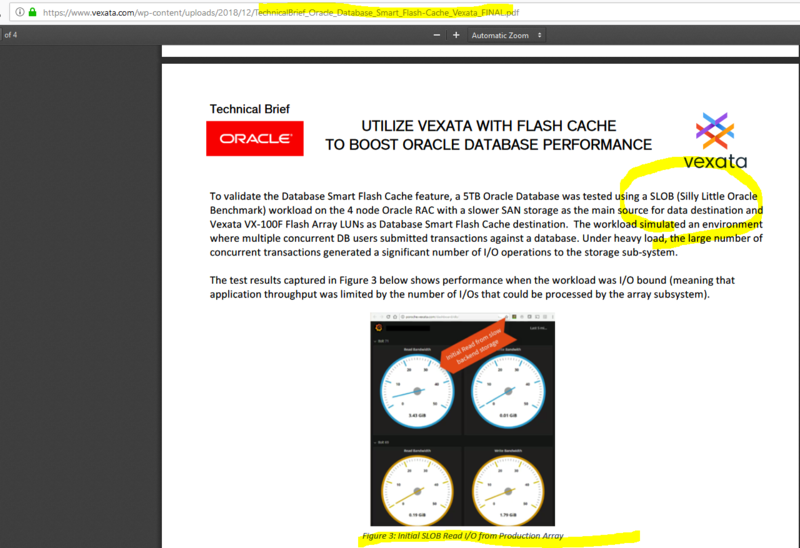 The VCE Solution guide for consolidating databases includes proof points based on SLOB testing at the following link: http://www.vce.com/asset/documents/oracle-sap-sql-on-vblock-540-solutions-guide.pdf. 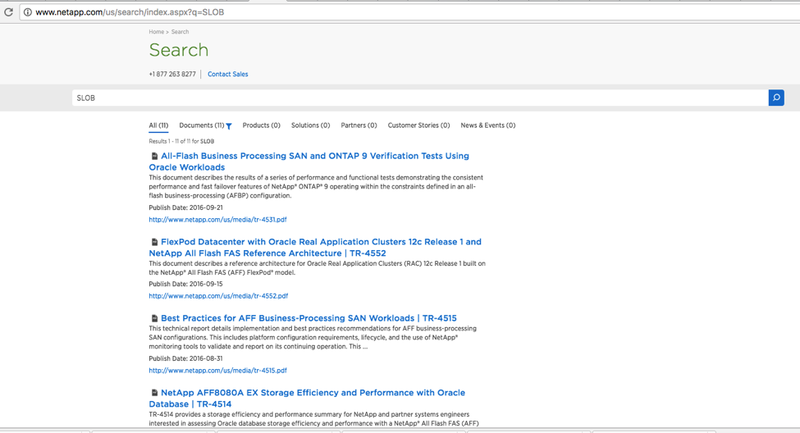 NetApp has a lot of articles showcasing SLOB results. The first is at the following link: https://www.netapp.com/us/media/nva-0012-design.pdf. In March 2019, NetApp published a great technical article (tr-4767.pdf) on the value of NVMeOF for Real Application Clusters. I recommend this article because NVMeOF is the emerging best of breed storage connectivity technology the industry has to offer. 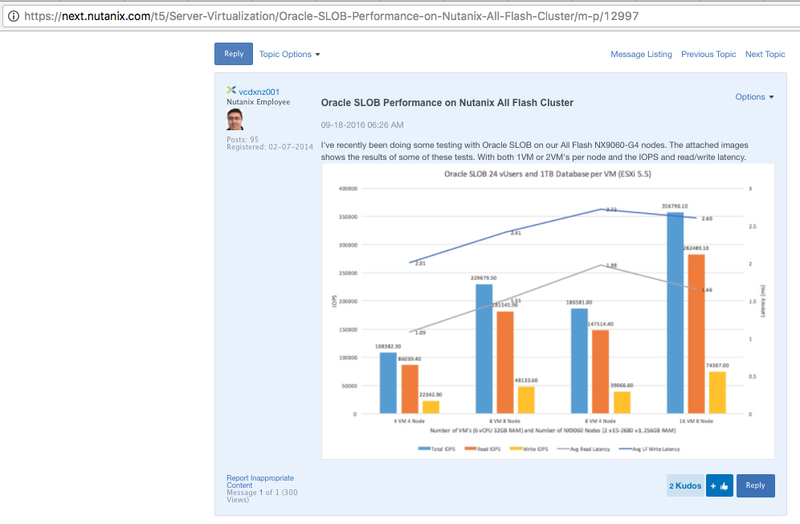 Kudos to NetApp for sharing platform performance proof points with a freely available, understandable and believable Oracle Database I/O testing toolkit–SLOB. The paper can be downloaded here. 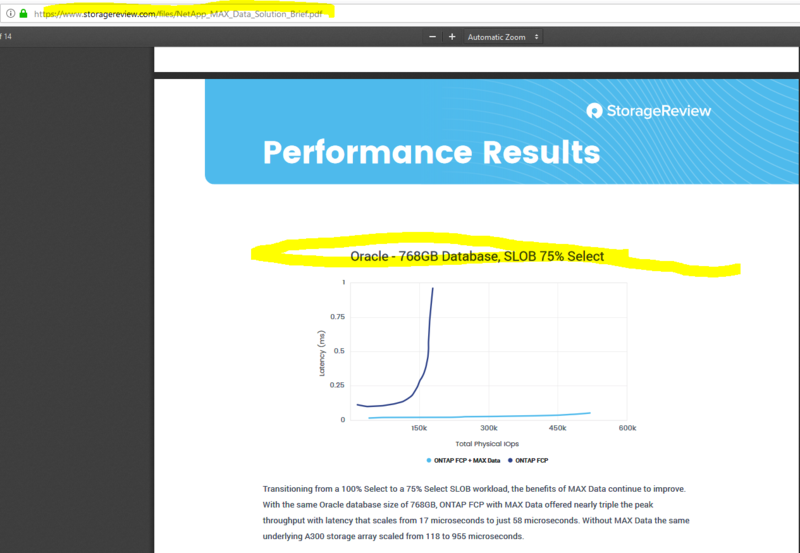 The following NetApp article entitled NetApp AFF8080 EX Performance and Server Consolidation with Oracle Database also features SLOB results and can be found here: https://www.netapp.com/us/media/tr-4415.pdf. Yet another SLOB-related NetApp article entitled Oracle Performance Using NetApp Private Storage for SoftLayer can be found here: http://www.netapp.com/us/media/tr-4373.pdf. 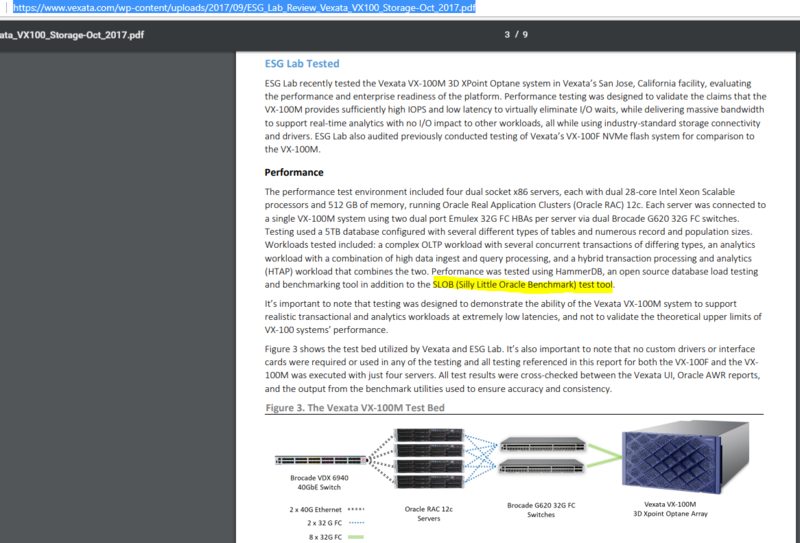 Nimble Storage offers the following blog post with SLOB testing results: https://connect.nimblestorage.com/people/tdau/blog/2013/08/14. There is an IBM “8-bar logo” presentation showing SLOB results here: http://coug.ab.ca/wp-content/uploads/2014/02/Accelerating-Applications-with-IBM-FlashJAN14-v2.pdf. I also find it interesting that folks contributing code to the Linux Kernel include SLOB results showing value of their contributions such as here: http://lkml.iu.edu/hypermail/linux/kernel/1302.2/01524.html. Next we see Red Hat disclosing Live Migration capabilities that involve SLOB workloads: https://www.linux-kvm.org/images/6/66/2012-forum-live-migration.pdf. 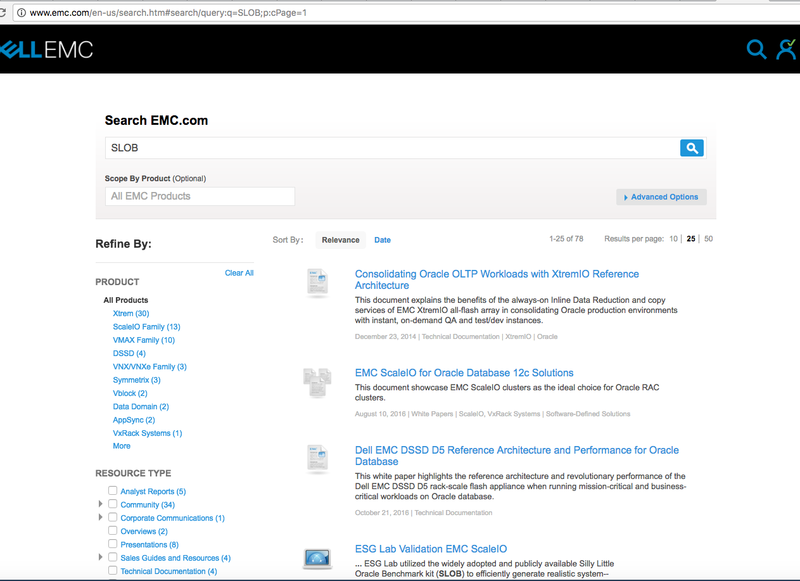 Another usage of SLOB by DellEMC can be found at the following link: http://www.principledtechnologies.com/Dell/VMAX_250F_PowerEdge_R930_Oracle_perf_0417_v3.pdf. This paper is a partner effort with Principled Technologies and it showcases a VMAX 250F All-Flash Array performance characterization with SLOB. 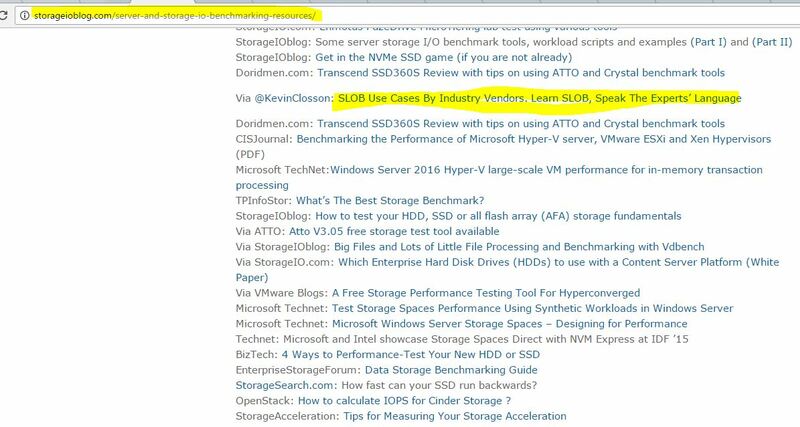 I took a moment to search the main DellEMC website for articles containing the word SLOB and found 76 such articles! Datrium have posted SLOB testing results for their Datrium AllFlash suite. 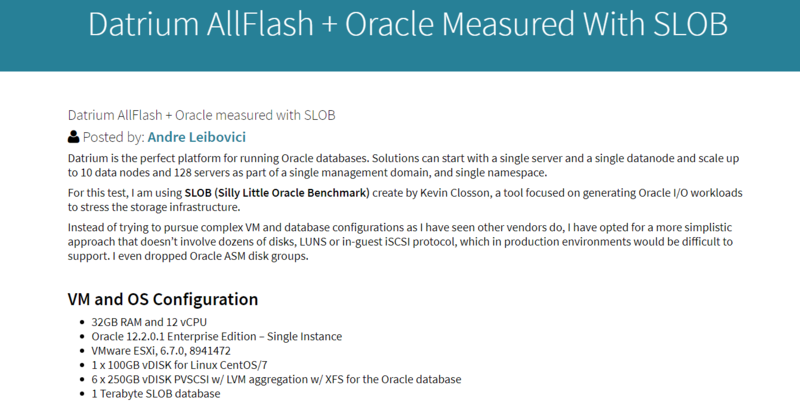 Although not a vendor, it deserves mention that Greg Shultz of Server StorageIO and UnlimitedIO LLC lists SLOB alongside other platform and I/O testing toolkits. 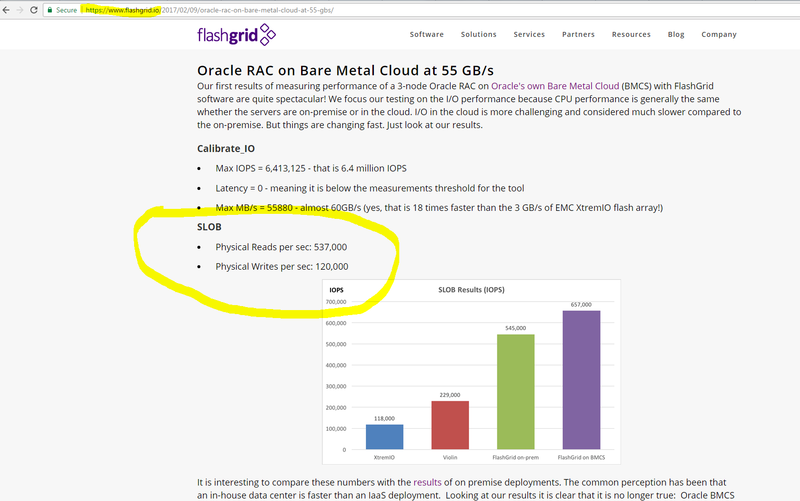 Greg’s exhaustive list can be found here: http://storageioblog.com/server-and-storage-io-benchmarking-resources/. More and more people are using SLOB. 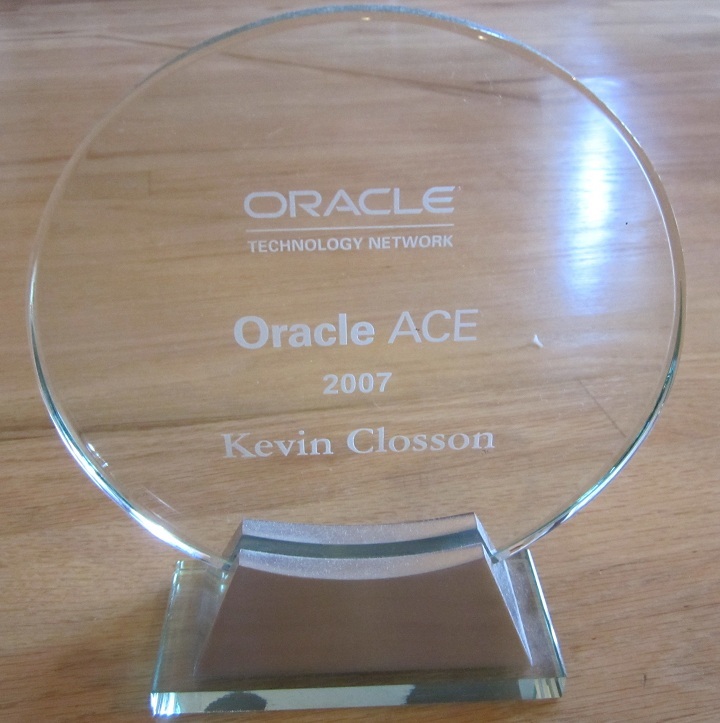 If you are into Oracle Database platform performance I think you should join the club! Maybe you’ll even take interest in joining the Twitter SLOB list: https://twitter.com/kevinclosson/lists/slob-community.